Given that it is just over a year since we proudly re-formed Number 1(Fighter) Squadron as an operational Typhoon Front Line unit, I thought it would be pertinent to give you an update, on what has been an extremely busy period for us. Number 1(Fighter) Squadron officially returned to frontline status as the fourth operational Typhoon Squadron on 15 September 2012 when, at a stand up parade held during the Jubilee Airshow at RAF Leuchars, the Squadron was presented with a new squadron standard, emblazoned with the Squadron battle honours. The Battle of Britain Memorial Flight Spitfire and Hurricane flypast added an historical flavour to the occasion, before the next chapter in the remarkable history of 1(Fighter) Squadron was marked by a 4-ship Typhoon flypast. The Red Arrows, trailing red and white smoke, the Squadron colours, closed the parade in typically spectacular fashion, in symphony with the RAF Central Band. Lastly, the new Squadron Standard was consecrated by the Deputy Chaplain in Chief and presented by the reviewing officer, Air Chief Marshal Sir Stephen Dalton. It was an absolute pleasure to see the re-formation of such a historically relevant Squadron. 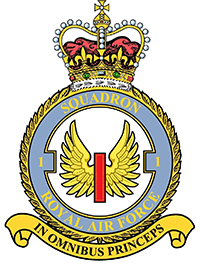 Indeed, Number 1(Fighter) Sqn was one of the first founder squadrons in the Royal Flying Corps when formed on 13 May 1912; however its origins date back much further, to the Number 1 Airship Company, which was formed in 1878. Deployed to France during the First World War in March 1915 the Squadron operated various types of aircraft in a multitude of roles over the Western Front before returning to the UK in 1919. After moving to India in 1920 and then Iraq in 1921 to conduct policing duties the Squadron was briefly disbanded in 1926. Re-formed at Tangmere in February 1927 and equipped with Siskins, the Squadron was then re-equipped with Furies in 1932 and Hurricanes in 1938. At the outbreak of the Second World War the Squadron again deployed to France but returned to the UK in May 1940 where it took part in the Battle of Britain. Converting to Typhoon 1B’s in July 1942, the Squadron flew in a fighter-bomber role on cross channel sweep duties before converting to Spitfire in April 1944. Post War the Squadron was equipped with Meteors and then Hunters and operated from Tangmere before moving to Stradishall, Waterbeach and West Raynham. In August 1969, now based at RAF Wittering in Cambridgeshire, the Squadron brought into service the Harrier ‘Jump Jet’. The Squadron would fly various types of Harrier for the next 40 years seeing service in Belize 1975, 1977 and from the deck of HMS Hermes in the Falklands campaign in 1982. Between 1991 and 2003 the Squadron deployed for operations in Iraq, Bosnia and Kosovo and conducted missions from the deck of HMS Invincible during Op BOLTON. From 2005 the Squadron would continuously support Joint Force Harrier’s commitment to Op HERRICK from Kandahar, Afghanistan, until July 2010 when 1(Fighter) Squadron was the last UK Harrier Squadron to fly on operations. Following a Strategic Defence and Security Review the Harrier was retired from service and the Squadron disbanded on 29 January 2011 at RAF Cottesmore. Given the historical relevance of such a battle proven Squadron, it was a privilege to be able to command the re-formation, with the three fly pasts being particularly poignant, as we start a new chapter in the phenomenal history of Number 1(Fighter) Squadron. Photos, from top left, clockwise: Various formal parade photos including a flypast from the Red Arrows, the presentation of Sqn Standard, AM Dalton inspecting the Parade, and the marching off of the newly consecrated 1(F) Sqn Standard. 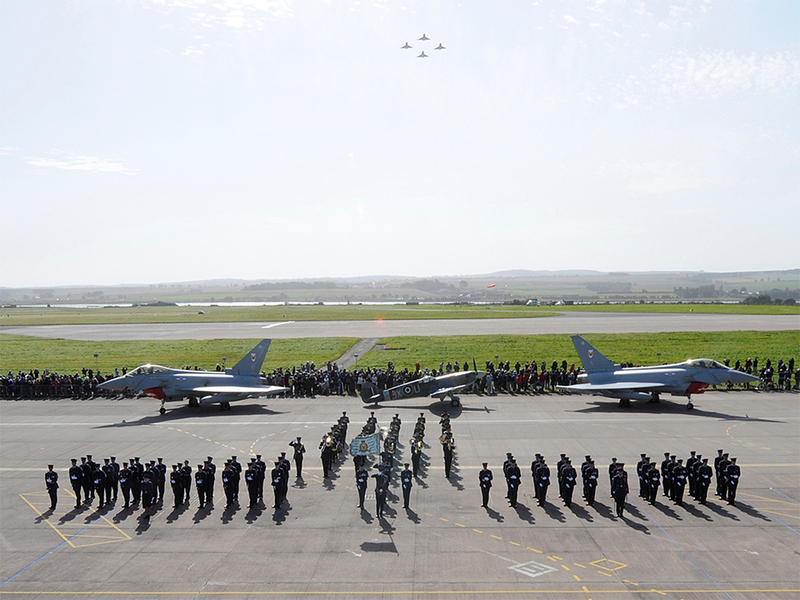 Photo: General salute during the re-formation parade, marked by a 1(F) Sqn Typhoon 4-ship flypast. It has been a remarkable first year for Number 1(Fighter) Squadron since re-forming as the fourth Front-Line Typhoon unit in September 2012 at RAF Leuchars. In an eventful first year, Number 1 (Fighter) Squadron not only moved into its new home on the RAF Leuchars Southern Hardened Aircraft Shelter (HAS) site but also deployed around the world participating in a variety of joint multinational exercises. Additionally, the Squadron has made vital contributions to standing commitments in the Falkland Islands and maintains RAF Leuchars’ Quick Reaction Alert around the clock, 365 days a year. Immediately following the 2012 RAF Leuchars Airshow stand-up parade, Number 1 (Fighter) Squadron personnel contributed to both the Tactical Leadership Programme in Albacete Air Base, Spain and the Advanced Tactical Leadership Programme at Al-Dhafra Air Base in the United Arab Emirates. During both Exercises, Number 1 (Fighter) Squadron pilots trained to deliver contingent capability in large force (coalition) operations, pitting their skills against the likes of US F-15, F-16 and F-22 aircraft as well as French Mirage 2000 and Rafale platforms and advanced UAE F-16 and Pakistani F-7s. The end of 2012 saw Number 1 (Fighter) Squadron return to the UAE, this time to Al-Minhad Air Base to participate in Exercise SHAHEEN STAR 2. The Squadron trained with our partner nations in unfamiliar surrounds, providing essential training for potential future operations. Such deployments also expose Squadron engineers to operating in extreme temperatures which presents challenges beyond the norms of north east Fife. Once again, Number 1(Fighter) Squadron pilots had the opportunity to test themselves against arguably the world’s most advanced fighter, the F-22, in combat manoeuvres. The squadron also flew two Typhoons to Muscat, to join the Prime Minister, and officially mark the procurement of Typhoon by the Royal Air Force of Oman. 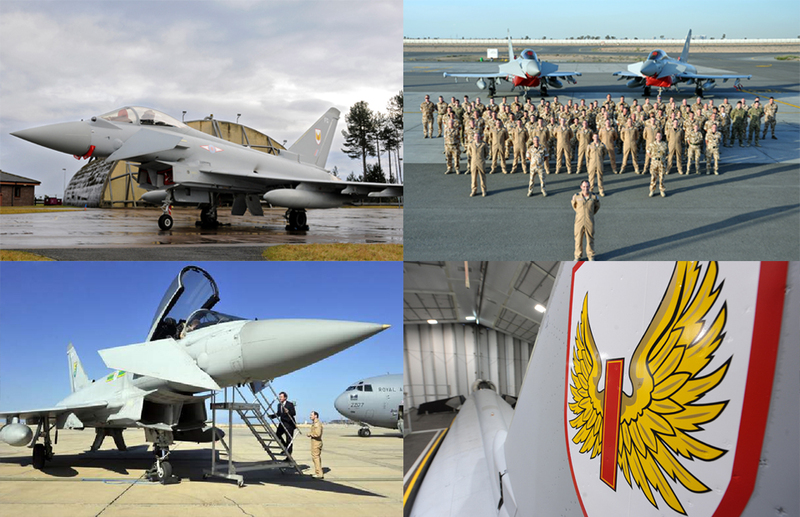 Photos, from top left, clockwise: 1 Sqn HAS Site, Detachment Photo – Al Minhad AB, 1(F) Sqn tail markings on the 100th Typhoon to enter service, OC1 (F) Sqn and the UK Prime Minister in Oman. Eight January 2013 marked a proud milestone in this new chapter of 1(Fighter) Squadron history as it moved to autonomous flying operations in premises on the southern side of the RAF Leuchars airfield. The move followed nine months of complex preparatory activity which witnessed the restoration of the ‘Cold War’ era front line HAS site, in order for it to become compliant with the operational demands of the Squadron’s new state-of-the-art Typhoon aircraft. January also saw Number 1 (Fighter) Squadron accept the 100th Typhoon to enter RAF service and the whole station was proud to see the aircraft wearing Number 1(Fighter) Squadron markings. The Sqn is flying this milestone aircraft in its centenary year, being formed in 1912, making the allocation of Typhoon ZK339 to the ‘Winged Ones’ strength even more poignant. February saw the Squadron’s first Overseas Training Flight since re-forming to sister Typhoon base Gioia del Colle in Southern Italy. A detachment of 4 Italian Air Force Typhoons from IX Gruppo Caccia also conducted a reciprocal visit to Number 1 (Fighter) Squadron. The visit was a fantastic opportunity to develop force integration with the Italian Air Force engineers and pilots whilst an element of social development on behalf of both nations helped to garner priceless esprit de corps with our Typhoon partner nations. March was yet another month of firsts for 1(Fighter) Squadron – very much delivering on the Squadron motto - In Omnibus Princeps – First in All Things. Four of the RAF’s most capable Typhoon aircraft successfully deployed to Royal Malaysian Air Force Base Butterworth to participate in the Langkawi International Military Air Show followed by the multinational exercise, Exercise BERSAMA SHIELD. In what can best be described as an epic journey, the aircraft completed the 8,000 miles in four stages via Cyprus, Bahrain and Sri Lanka in four days; the first Squadron to deliver such a significant deployment over such a short period of time. Throughout, Number 1 (Fighter) Squadron were supported by an Italian Air Force KC 767 for air-to-air refuelling during the trail. Significantly, the Squadron also made use of the RAF’s newest and largest ever aircraft, Voyager, to deploy the main party. 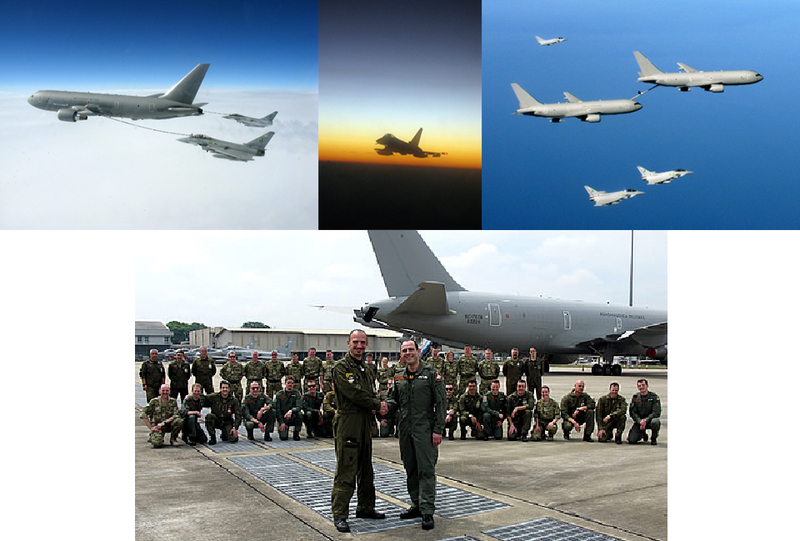 Photos, from top left, clockwise: 1 (F) Sqn trail to Malaysia with an Italian KC-767, Two KC767s buddy-buddy tank over Italy, Joint Sqn photo with the trail team on arrival. As part of the Exercise, Number 1(Fighter) Squadron worked in conjunction with RAF Regiment Joint Tactical Air Controllers to further develop the pilot’s Multi-Role capability. Flying Close Air Support training missions over dense Malaysian jungle was far removed from the sleet and snow left behind in Fife. The Exercise also saw flying with a mix of western and Former Soviet Union aircraft employed by the nations of the Five Powers Defence Agreement allowing for dissimilar training to occur with types likely to be flown by potential adversaries. The mix of mission tasking allowed all pilots to become familiar with the full multi-role capability of the aircraft and soon the prowess of Typhoon, when pitched against F-5, F-15, F-16, F-18 and MiG 29, became a re-assuring feeling for the pilots. The opportunity to demonstrate the aircraft and its capabilities to members of other nation’s air forces was a rewarding experience for all Squadron personnel. 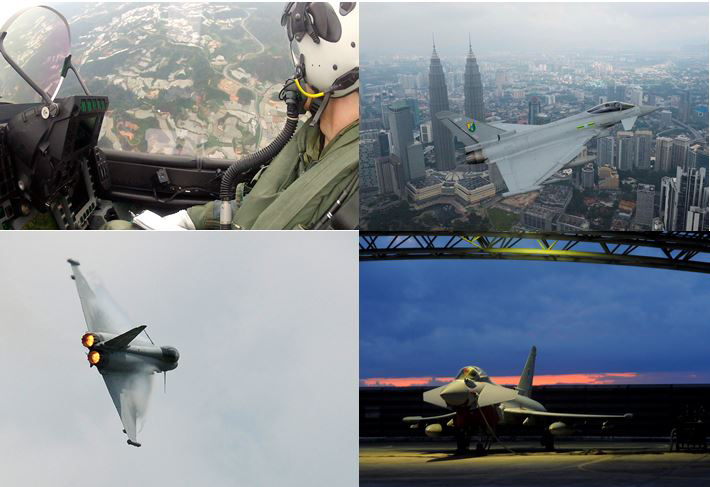 Photos, from top left, clockwise: CAS over the Malaysian jungle, Flypast of the Petronas Towers Kuala Lumpur, Typhoon resting in a sun shelter at RMAF Butterworth, Typhoon max performing in the moist Malaysian air. On returning to the UK it wasn’t long before 1(Fighter) Squadron were called upon to support a UK based exercise, deploying to our future home at RAF Lossiemouth, to be the lead Typhoon Squadron in support of the Combined Qualified Weapons Instructor (CQWI) course. Although not as far detached as Malaysia, 1(Fighter) showed once more that it could deploy quickly and efficiently to another MOB, whilst supporting a weapons instructor course and a significant flying programme. Typhoon candidates from across the Force planned and led entire missions along with their peers from other aircraft types. Each day saw a main exercise wave with platforms such as Typhoon, Tornado, Sentry, Voyager and Sentinel all working together against an ‘adversary’ force, followed by an afternoon training wave where the Squadron could partake in other large formation exercises, in addition to more routine syllabus sorties. It also gave the Sqn an invaluable opportunity to explore what will become our new home in 2014, where Sqn personnel were able to work from 1(Fighter) Squadron’s new hanger, in addition to exploring the broader area and domestic accommodation in the vicinity of RAF Lossiemouth. 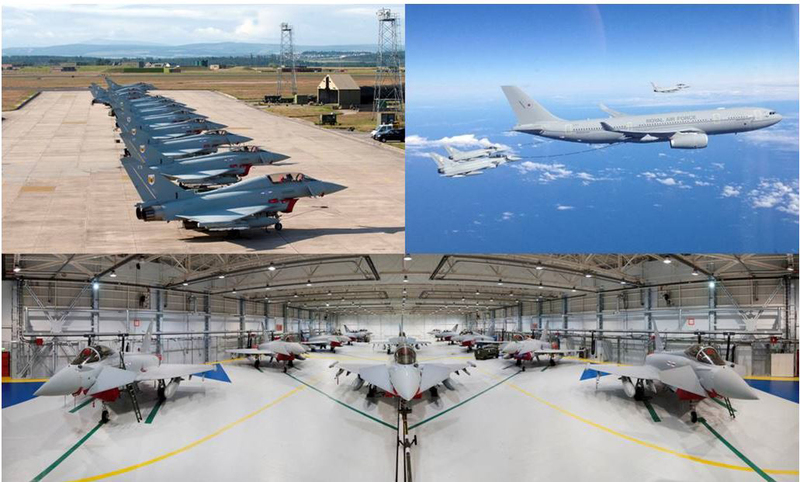 Photos, from top left, clockwise: 12 aircraft on the line at RAF Lossiemouth – EX CQWI, 1(F) Sqn refueling from a UK Voyager aircraft during Ex CQWI, the new 1(F) Sqn hangar at RAF Lossiemouth housing 12 Typhoon aircraft. Following an intense two weeks of high-end Multi-Role (MR) training, what better way to relax than to go for a jaunt in the Scottish Highlands? To that end, the Squadron decided to make use of the August bank holiday weekend to do just that, only the jaunt in question was actually the substantial ‘Ramsay’s Round challenge’ which involved climbing 24 Munroes – a total distance of 56 miles and the equivalent ascent of Everest – some 28,500 feet. The team lead by OC 1(F) set off at 0900L (9.00 am) from the Fort William Youth hostel to scale the highest mountain in the UK – Ben Nevis. Having completed what most people do in a day, the team marched onward in difficult weather conditions to make good progress across the first section of the challenge, with phenomenal support from a dedicated and passionate 1(F) Sqn support tem. After 25 hours on the go, and with a welcome respite in the weather, excellent progress was made in ideal conditions over the Mamores to finish at 2245L (10.45 pm) on the following day. The entire team celebrated at Glen Nevis Youth Hostel with a bottle of 1(Fighter) Squadron champagne to praise the hard work of all involved to complete the round in a gruelling 37 hours and 29 minutes. Of note, a final sum of over £2500 was raised as a result of the challenge, which has been donated to the ‘Cardiomyopathy Association’ and the ‘Children’s Hospice of Scotland’. Photos, Left to Right: 1 (F) Sqn before and after the ‘Ramsay Round Challenge’. To bring to an end an extremely busy year, the Sqn was tasked to RAF Leeming, in order to support Exercise Joint Warrior and Capable Eagle, an Expeditionary Air Wing and multi national air-maritime exercise, as the lead air element. Drawing on recent experience and completing additional field training in very short order, the Sqn embarked on a unique venture, led by a joint team of French and British air commanders; a move that paves the way to continued cooperation and training at the tactical, operational and strategic levels. The exercise scenario replicated the challenges faced by a British-French Expeditionary Air Wing as it helps an overseas power cope with rising political and military instability. The exercise was extremely successful for 1(Fighter) Squadron, during which it – once again – became adept in austere field conditions, delivering a complex flying programme, whilst dropping 10 Paveway II A-S weapons, in addition to liaising and working closely with the French Mirage 2000s on a daily basis. 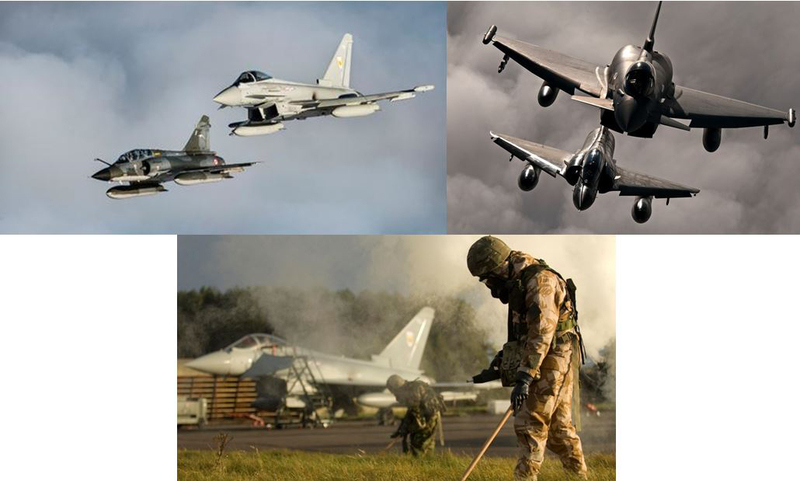 Photos, from top Left, clockwise: Air-Air photo shoot with French M2000, post attack recovery drills with a 1(F) Sqn aircraft in the background. In the wake of such a busy first year of true autonomy, Number 1 (Fighter) Squadron has no time to relax. 2014 will see the Squadron build upon its 1st year successes, further develop Typhoon Force multi-role capability, whilst remaining at the forefront of broader Typhoon capability growth. Looking ahead, there are already a number of exciting opportunities on the horizon for the RAF’s oldest Squadron, including exercise Red Flag in the United States, not to mention the intricacies of a Main Operating Base move later in the year! With thanks for your enduring support.